The Washington Post — Ugandan politics is more interesting and unpredictable now than it has been for over a decade. As the country approaches the next general elections, scheduled for early next year, President Yoweri Museveni faces a challenge to his authority that has awakened fresh excitement in the political process. But this challenge has not come from a more effective or united opposition. As in previous polls, opposition parties are weak and disunited. Instead, the threat to Museveni comes from within his own National Resistance Movement (NRM) government in the shape of Amama Mbabazi, a former government insider who earlier this year announced his intention of challenging Museveni for the presidency. Mbabazi initially pledged that he would remain in the NRM and campaign to displace Museveni as the Movement’s presidential candidate, but subsequently reversed that decision and will now contest the election as an independent. Mbabazi’s candidacy is particularly threatening to Museveni for four main reasons. 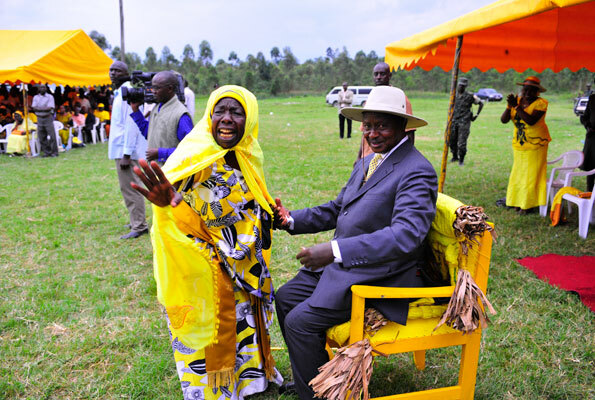 First, his defection weakens the NRM’s own support base, which Mbabazi had helped to build. Second, NRM leaders fear that Mbabazi will prove able to persuade other disgruntled figures to join him, leading to a hemorrhage in the Movement of some of its best minds. Third, an alliance between Mbabazi and other opposition parties could galvanize a range of different political and civil society groups that had previously given up on the prospects for change. Finally, Mbabazi’s claim to “embody the true objectives and identity of the NRM” promises to shine a light on the failed promises of the Museveni government. More broadly, Mbabazi’s rise to political prominence is significant because it highlights a general trend in African politics: dominant parties, which consistently win large legislative majorities and presidential elections, are typically brought down not by opposition parties, but by internal party splits. On the one hand, dominant parties, such as the African National Congress (ANC) in South Africa, are so large and powerful that they rarely face defeat at the ballot box. On the other, the “broad church” nature of these parties means that they typically find it hard to keep all of their factions happy, and so are particularly prone to internal divisions. This has come to the fore over the last month, as the authority of the ANC has been challenged by anti-corruption and student protests led by a number of figures that were formerly part of the ruling party. Most notably, Julius Malema was the president of the ANC youth league, but left to form the Economic Freedom Fighters after falling out with party leaders. Thus the key to understanding political change in countries with dominant parties (e.g., Angola, Botswana and Namibia) is found in the state of internal party politics. In Kenya, for example, the Kenyan African National Union held power from independence until 2002, and was only defeated after a divisive battle to succeed the outgoing president, Daniel arap Moi, led a number of key leaders to abandon the party. But how will Mbabazi fare in the elections? There are two theories about the prospects for Mbabazi. The first is that he has already peaked. Mbabazi failed to secure an electoral alliance — known as The Democratic Alliance — with Kizza Besigye, a veteran in the opposition and three-time presidential loser. Some argue this failure meant Mbabazi has lost any opportunity of success. A pessimistic account of Mbabazi’s prospects holds that even though Besigye’s support apparently declined in 2011, without his votes Mbabazi cannot win. The second view is that Mbabazi still has much to play for, either as a presidential candidate or as someone who can negotiate some sort of transition. Mbabazi is personally wealthy (though popular rumors may overstate the extent of his riches); and his many years at the heart of the ruling party have given him an unparalleled shadow network in the party, government and security services. According to this more optimistic account of Mbabazi’s prospects, the failed alliance is not a fatal blow. Actually, it may free him to make deals with the many aspiring MPs and councilors who lose out in the NRM primaries currently under way. Mbabazi, the argument goes, has the money and connections to back disappointed NRM members as independent candidates. By doing so he will acquire, ready-made, the national organization that he currently lacks. Thus far, uniting the opposition has not been enough to unseat Museveni. Uganda’s long-serving president has defeated a united opposition before (in 1996) and he has consistently secured more votes than all other candidates combined. In the last three elections, Besigye has been the sole opposition candidate in all but name, and the vote share for other presidential candidates has been pitiful. To secure victory, Mbabazi would have to persuade millions of Museveni supporters, or abstainers (recorded participation rates are low) to vote for him. What are the prospects for regime change in Uganda? There is widespread popular skepticism about the freedom and fairness of elections in Uganda, and the . Many find it difficult to believe that Museveni could ever be declared the loser in an election. But Mbabazi has articulated a concern that is widespread within the NRM. It is not hard to find ordinary members of the Movement who, despite an almost reverential admiration for Museveni, feel that he has ‘overstayed’. Those who have benefitted from the long years of relative stability under NRM (especially those from south-western Uganda) fear that delaying the question of succession increases the risk of conflict and disorder when the transition finally does come. But still, losers in the NRM nominations will hesitate to openly campaign against Museveni. He still controls the security forces, and his pockets are far deeper than Mbabazi’s — even though Uganda can ill afford a repeat of the abundant government spending that preceded Museveni’s victory in 2011. In such a context, many Ugandans — politicians as well as voters — will ask themselves whether they should risk backing someone who is likely to lose in a game which is so deeply unequal. Museveni has always made it clear that those who back his opponents can expect to lose the favor of the state. Worries about long-term stability have to be weighed against the medium-term benefits of patronage: if you want new roads, or clinics, in your area; or if your children hope for scholarships and jobs, voting for the opposition may not be a good idea. The failure of Mbabazi and Besigye to forge an alliance makes it seem an even more risky decision. Meanwhile, Besigye, after refusing to ally with Mbabazi’s campaign, is pursuing the same strategy that has repeatedly led to his defeat in the past. In short, he seems to hope that political change will come through street protests, rather than the ballot box. The government is effectively preventing him from campaigning on the pretext that the legal campaign period starts only in November (a restriction not enforced on Museveni). Besigye’s response is to call rallies. The government, predictably, detains him briefly to stop him from reaching the rally, and disperses his supporters with batons; and the media becomes briefly awash with photographs of opposition politicians being manhandled, and clouds of tear gas. While this technique has earned Besigye much admiration for his personal courage, it has not inspired popular revolt. It has simply become a routinized display of Museveni’s dominance; and it lends some credence to the government propaganda linking Besigye and violent disorder. So what will happen? The next few weeks will be crucial. If defeated NRM candidates rush to join Mbabazi, and start to campaign openly for him, perhaps he will find himself in a position of some negotiating power. (Mbabazi’s strategy may always have been to create a position in which, rather than face the cost and disruption of a closely-contested and disputed election, Museveni would negotiate some sort of transition.) But if they do not, his campaign to engineer a transition will have come to nothing, and February will see another Museveni and NRM victory. The NRM will not rule forever. The internal splits that led to Mbabazi’s defection have exposed the NRM fault lines. Further defections are likely in the near future, and will erode the ruling party’s morale and grip on power. In turn, these tensions, combined with the intense factional conflict that will engulf the Movement when it needs to replace Museveni — now 71 — are likely to lead to further divisions. What can we learn from the Ugandan example relevant to other African countries with dominant parties? As in other African states governed by a dominant party, the prospects for political change in Uganda will depend on the ability of Museveni and those that will come after him to hold the NRM together, a task that promises to get significantly more difficult in the years to come. The same is likely to be true for the other dominant-party states on the continent. As the hold of nationalism fades, it will become increasingly difficult for presidents in Namibia and South Africa to maintain the unity and sense of purpose of their governments. Those looking for a historical precedent through which to understand contemporary events should look back to the experience of the nationalist coalitions that took power in Africa following the end of colonial rule. At first, these broad and often multi-ethnic alliances appeared all conquering, but over time they gradually unravelled as a result of competition over resources, internal splits and generational change. Ultimately, very few of the movements that held power in the 1960s were able to retain power without repressing opposition parties and downgrading democratic institutions. This is a strategy that Museveni has already employed to full effect in Uganda. The fate of democratic consolidation in Africa will depend on whether other leaders in countries that are currently more open and liberal will decide to follow suit when push comes to shove.